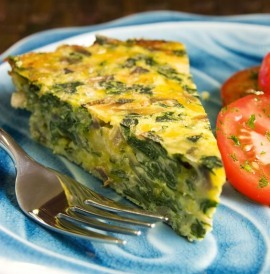 Spinach quiche, or quiche Florentine, is a wonderful vegetarian quiche recipe. The spinach, cream, cheese and onion combination is wonderful and may actually get a non-spinach eater to the table. Melt the butter in a saucepan and sauté onions until tender. In bowl combine spinach, onions, salt, pepper, nutmeg and 1/2 cup Parmesan cheese. Beat cream and eggs together and combine with the spinach mixture. Pour into the pie shell, and sprinkle with remaining cheese. Bake for 30 minutes. Makes one quiche, 6 servings. Try brushing Dijon mustard (or a mustard of your own preference) on the bottom of the pie shell before putting the filling in. It adds extra flavor. Quiche recipes are so easy to make for lunch, brunch or dinner. They are perfect for a brunch or breakfast buffet. Add a salad and it’s the perfect light lunch or dinner. The spinach and eggs in this recipe are both very healthy for us. If you like our Spinach Quiche recipe, have a look at our Cheddar Bacon Broccoli Quiche.